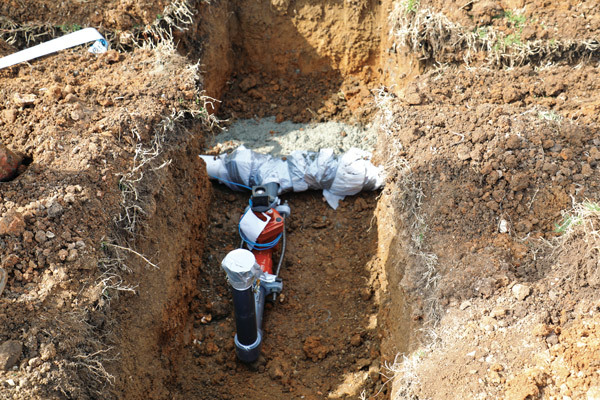 Installing an irrigation system is never an easy undertaking. 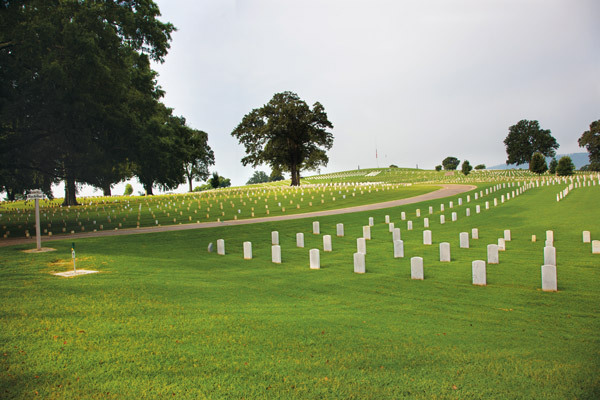 Add a cemetery to the mix, and not only do you have to dig trenches around the usual water lines and tree roots, but you also have to avoid gravesites. 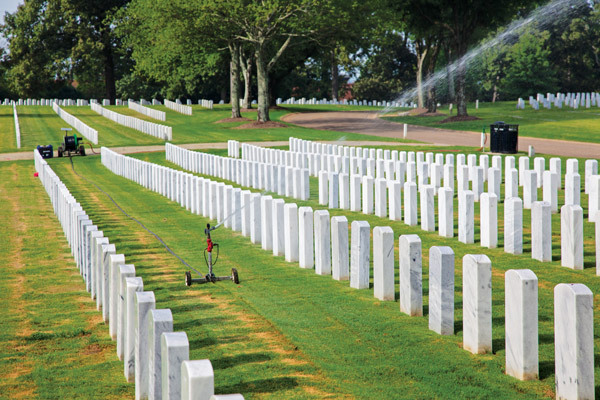 That’s what Landscape Services Inc. (LSI) did when it installed a new irrigation system at the Chattanooga National Cemetery. The crews were careful to never leave their work unfinished at the end of the day. 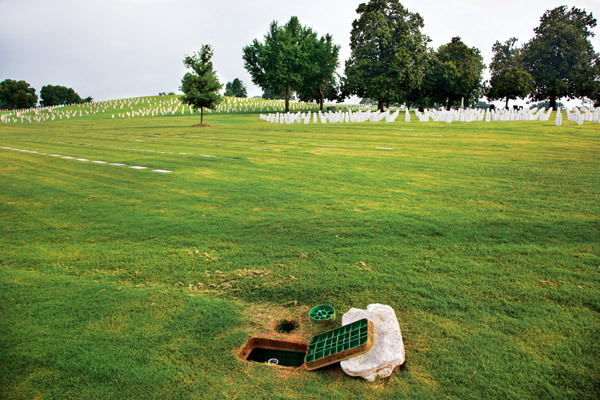 They completed one valve at a time and covered the irrigation pipes and valve boxes the same day. 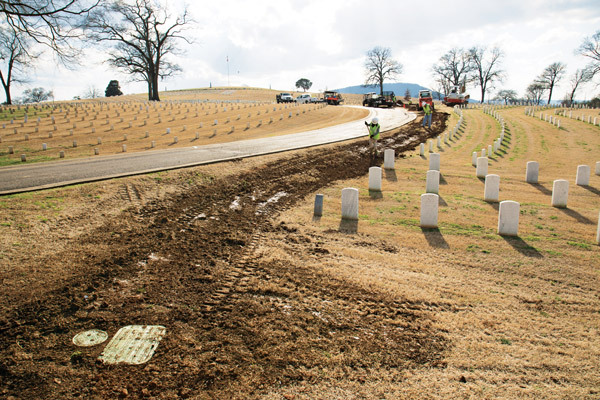 Despite the challenges, which also included boring underneath a road and hand digging several sections of the system, Stacey says he and his crew were honored to work on the grounds at the national cemetery. “I took more pride in my work than I maybe normally would have because of the property,” he says. These after pictures were taken in August and as you can see, the grass is very healthy and vibrant, even during the hottest part of the year. 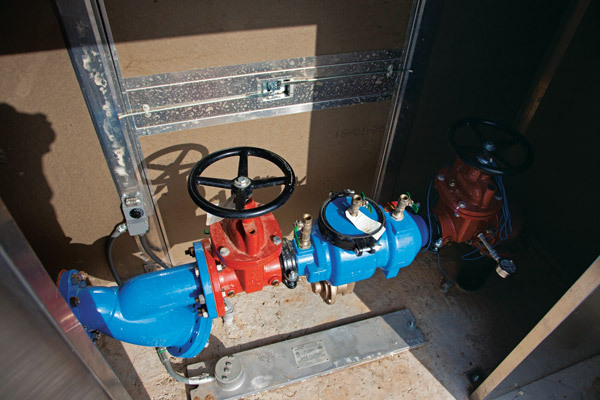 There are 55 Quick Disconnect valves on the site, eight of which can run at the same time, producing excellent efficiency. 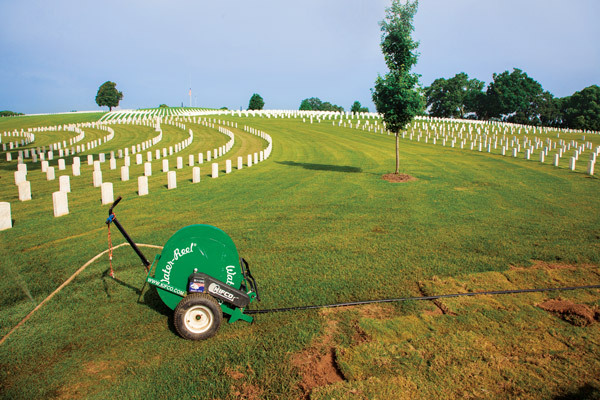 To not disturb any tombs, the rollability of these wheel hoses is the key for flexibility throughout the cemetery. 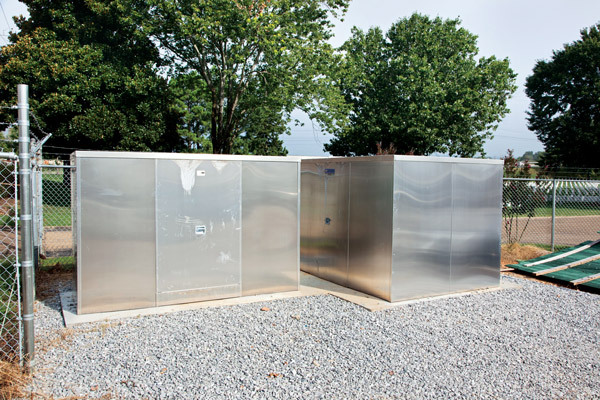 The valve boxes are nearly invisible when closed, as to not disturb the environmental look. 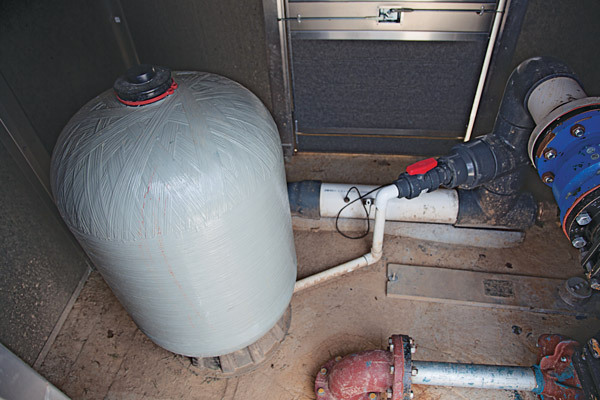 This is a look at the sealed boxes that cover the backflow preventer, pressure tank and the booster pump. This pressure tank controls the underground water lines with 400 psi of pressure in order for the water to move quickly through the four miles of pipe. Here is a look at the 3-inch backflow preventer that was installed on a very cleanly poured slab of cement. An in-progress picture of the same area as picture one. Lots of disturbance to the existing grounds with the trencher. 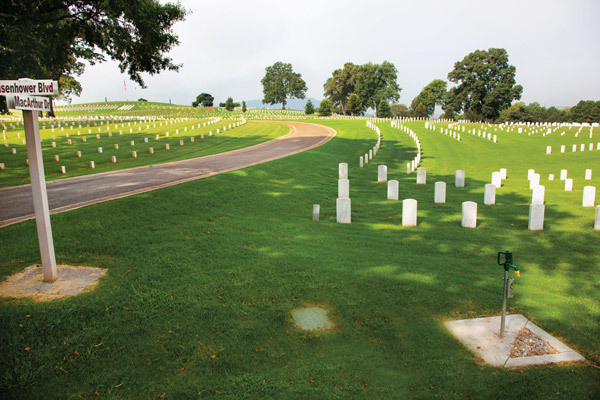 The Chattanooga National Cemetery has beautiful Bermudagrass throughout. Keeping it watered is key to its health. 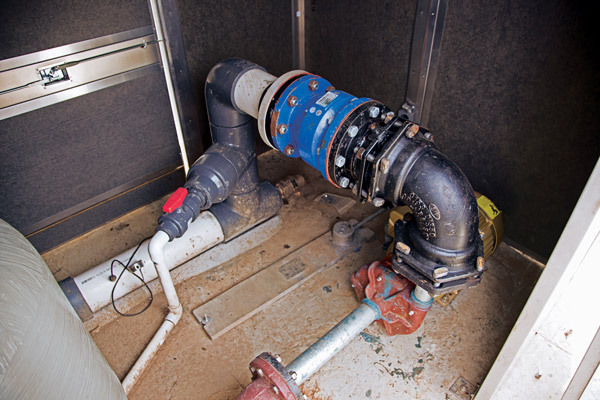 An in-ground look at the massive Quick Disconnect valves that were installed with a concrete backing for extra support from the water pressure. 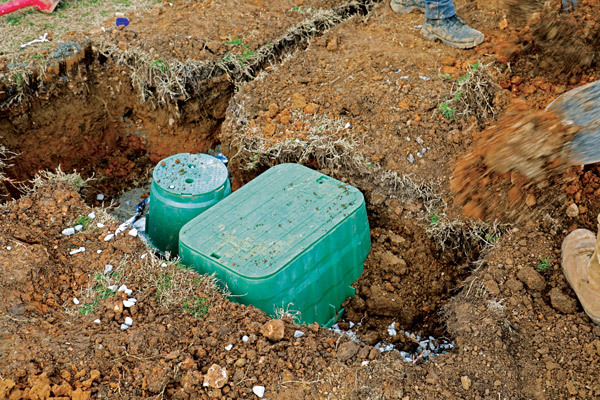 Prior to back-filling the hole, extreme importance to the client was to have the irrigation boxes level with the ground, to not sink. 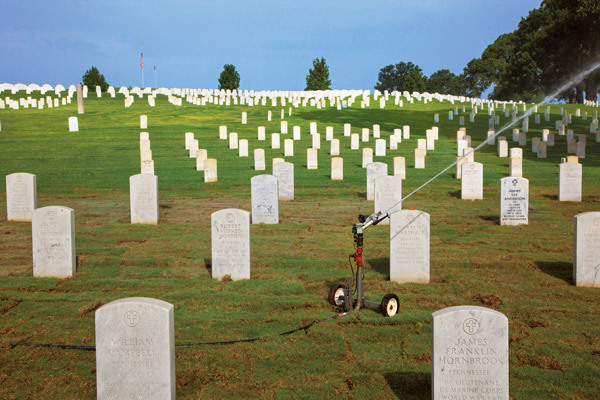 Covering 115 acres of Bermudagrass is the task of these irrigation sprinklers. This booster pump connected to the pressure tank works in sequence to allow the proper flow.